Already back in 1986 in a study sponsored by 3M was found that presenters who used visuals are by 43% more effective in persuading the audience. Together with an increase of available data, the importance of its visual presentation has massively enlarged. 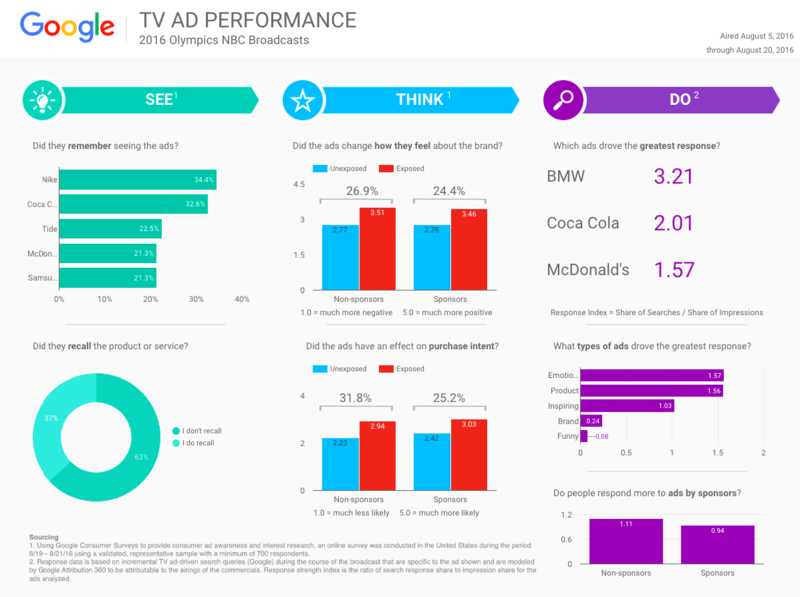 To meet the demand from data enthusiasts, Google developed a powerful solution for data visualisation — Google Data Studio, which allows its users to create convincing and visually appealing reports like one below. Broad data visualisation options — there is a wide variety of data visualisation options, which makes data analysis easier than in Google Analytics interface. 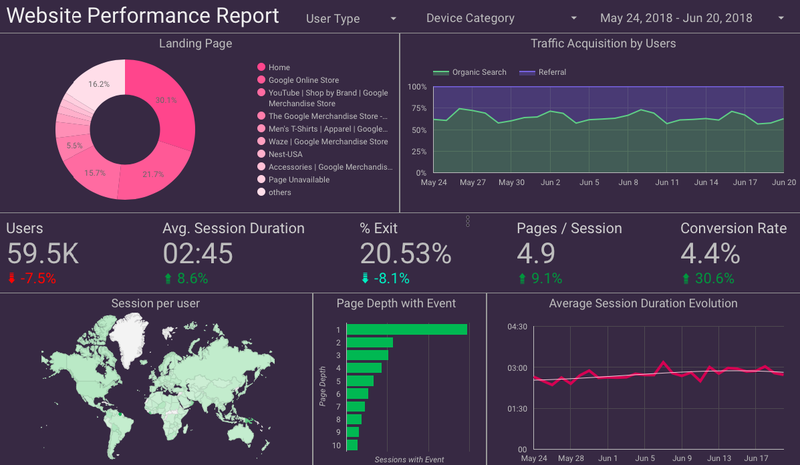 Dynamic updates — the dashboards are linked to the Google Analytics (GA) data, so all data is updated automatically by pulling data from GA database. Multiple sources — custom report can be built and visualised by linking different data sources and combining various dimensions and metrics. If I convinced you to create your first report, follow steps described in next paragraphs. How to create a good report? 1. Understand the purpose of the report — why are you making it, what data you want to include and what will you do with results. What is the main reason of making report? What kind of information do you want to visualize — basic or specific? Who will read the report and what is the knowledge base of reader about the topic? What will you do with the results of analysis? When you have an overall impression of what information report should include, create a new report or make a copy of existing one if few improvements need to be done. There are plenty of good how-to articles about creating a report or even templates to copy, therefore I won’t focus on this. However, I do suggest you to check the articles and examples even if you don’t need them — you can find some interesting and creative ideas of how to visualise information e.g. how to build a shopping behaviour funnel or which colour scheme to use, or which filters to place in a header. Inspiration never hurts, right? Now you should choose which data will have the biggest impact on your next actions and will be easy to understand at the same time. In toolbar you can find 11 data types to use. Think big and don’t stop with metrics or dimensions you see in a list — you can use segments, filters or create custom metrics and dimensions by custom formulas. Try not only different combinations but also different ways how to visualise data — e.g. maybe combined bar & line chart will be easier to read than a table. All combinations and visualisations should make sense. Despite how the magical data combination you have created looks impressive, it should give clear and true insights of what to do next. Otherwise, the beautiful traffic acquisition chart might be guilty on profit lost in next quarter. Less is more — don’t make one page overloaded with too many data. The report should be easy to read — that is why you made it in Google Data Studio and not in spreadsheet. If one page will be stuffed with a lot of information reader won’t understand where to look and to what pay attention. Better create two pages with the same topic and surround data with spaces around. So you have added the most appropriate data and the job should be done. No, you are only in the middle. Making report visually appealing is as important as adding correct data. Look at this step as your chance to create a story based on data — you can structurize elements in the order which would share surprising details, you can emphasize specific elements e.g. only 2 bars from whole 10-piece bar chart, you can add colours that sometimes will explain more than words and so on. Remember that reports in Google Data Studio are easier to understand than spreadsheets or Google Analytics Custom reports because you can change data format from boring tables to at least tables with different colour heat maps in them. Think creative and change colours, sizes, fonts, add pictures. Data visualisations should motivate report’s reader to listen to you more. However, you risk losing someone’s trust without checking added data. If you’ll provide false data, followed actions will not give expected results or might even make them worse. To avoid this, compare the data you added in the report with e.g GA data — some metrics will be easier to compare (like sessions, users, transactions) and some might need a custom report. Even though it takes time, it is necessary in order to make trustworthy statements and suggestions. Also, share the report with a colleague and ask him to evaluate the report. It will take some time until you’ll finish the report and you’ll be focused on something specific. Because of that, there might be details you didn’t think of e.g. data combinations. What’s more, a colleague will look at the report with a fresh eye and might point to combinations that do not make sense or are not necessary. Congratulations, the report is done! Hopefully the suggestions above helped you to find not only a way of how to get by 43% more persuasive but also how to find insights that will improve business you work on. 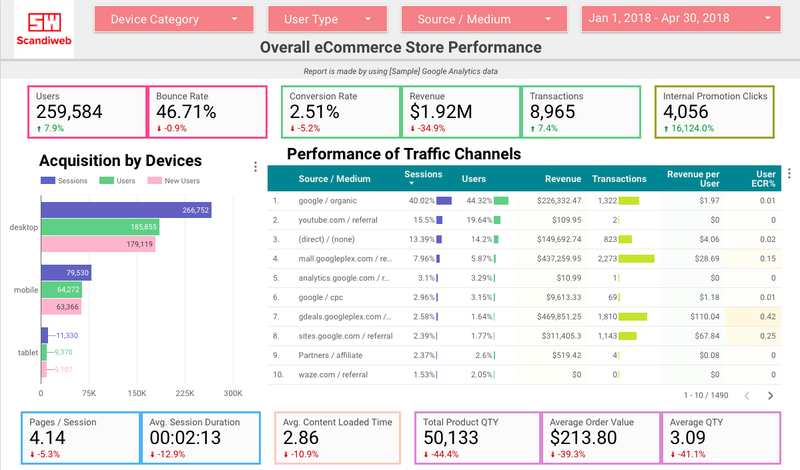 If you need any help with creating Google Data Studio report or if you would like to share your thoughts on tool write to marketing@scandiweb.com and we will be happy to have a chat with you.